RAWALPINDI: Pakistan Army on Saturday warned India that the nuclear-armed country is capable of defending its borders if a war is waged on it, moments after Indian Army chief General Bipin Rawat made inflammatory remarks against Pakistan. “We [Pakistan Army] are ready for war but choose to walk the path of peace in the interest of the people of Pakistan, the neighbours and the region,” Major General Asif Ghafoor, director general of the Inter-Services Public Relations (ISPR), said in reaction to Gen Rawat’s comments. On questions of talks with Pakistan, Gen Rawat reiterated the government’s stand that “talks and terrorism cannot go together”. “I think our government’s policy has been quite clear and concise. We’ve made no bones about the fact that talks and terrorism can’t go hand in hand. Pakistan needs to curb the menace of terrorism,” Gen Rawat added. 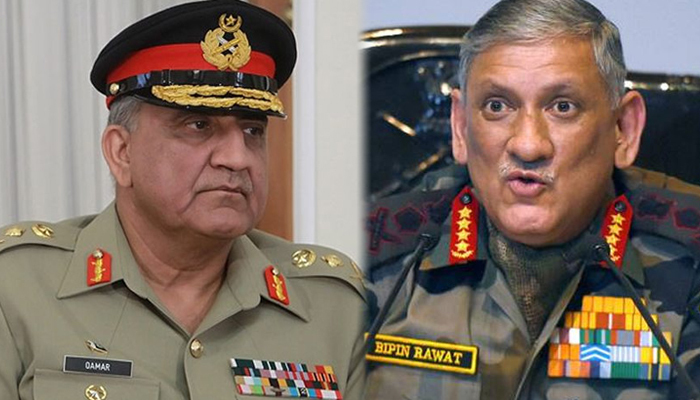 Reacting to the “surprise action” warning of the Indian army chief, the ISPR DG said: “India should not disturb the peace process”, terming Gen Rawat’s statement “irresponsible”. Gen Ghafoor said Pakistan has a long-standing record of fighting terrorism, adding “we know the price [that is paid] for peace”. “We have struggled to achieve peace in the last two decades. We can never do anything to disgrace any soldier,” he asserted, strongly denying the claims made by India that hold the Pakistan Army responsible for the killing of a Border Security Force (BSF) soldier. “As far as the issuance of postal tickets is concerned, the UN released a human rights violation report following which the then interim government issued those tickets highlighting the plight of Kashmiris. “To turn this into an excuse that the peace process has been tainted or that Pakistan has somehow changed its stance, is inappropriate,” the ISPR chief said. “The government of Pakistan’s offer still stands for India to come forward and hold talks with us,” the ISPR chief said. Moreover, Gen Ghafoor reasoned that India was resorting to such statements as it faced domestic issues, including the corruption allegations on the Modi government. Gen Rawat’s comments came shortly after Prime Minister Imran Khan took to Twitter earlier on Saturday to respond to India’s cancellation of the meeting between the Pakistani and Indian foreign ministers on the sidelines of the United Nations General Assembly (UNGA), calling New Delhi’s reaction “arrogant and negative”. “All my life I have come across small men occupying big offices who do not have the vision to see the larger picture,” added PM Khan. PM Khan had earlier written a letter to Prime Minister Narendra Modi expressing his desire for talks between the two countries and also suggested a meeting between the foreign ministers of the two countries. On Friday, the Indian government cancelled a meeting between the Pakistani and Indian foreign ministers, scheduled to be held on the sidelines of the United Nations General Assembly, just a day after confirming the development. Minister for Information and Broadcasting Fawad Chaudhry also promptly issued a response, backing the DG ISPR’s statement. “Pakistan and India are nuclear powers; a war is out of question,” he said. The information minister termed the Indian army chief’s statement an attempt to divert the attention of Indian public from the mega corruption scandal and the subsequent calls for resignation faced by PM Modi-led BJP government. Chaudhry said that the Indian army chief’s statement was inappropriate and that the general must refrain from using statements as a political tool. “The Indian army chief needs to understand that he is not a BJP leader,” Chaudhry remarked, adding that “the world stands witness to who wants war and who wants peace”. “As a peace-loving nation, Pakistan desires peace [with India],” he stressed, highlighting the fact that peace will be in the benefit of billions across both nations.